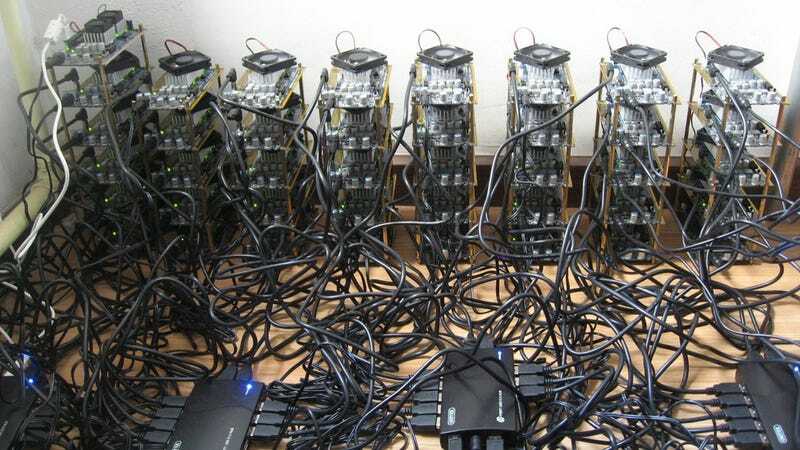 Bitcoin mining machines are insane powerhouses, and they're only getting crazier. How much power is getting sunk into the digital cryptocurrency? More than the world's top 500 supercomputers combined. What a waste. According to Bitcoin Watch, the whole Bitcoin network hit a record-breaking high of 1 exaFLOPS this weekend. When you're talking about FLOPS, you're really talking about the number of Floating-point Operations a computer can do Per Second, or more simply, how fast it can tear through math problems. It's a pretty common standard for measuring computer power. An exaFLOPS is 1018, or 1,000,000,000,000,000,000 math problems per second. The most powerful supercomputer in the world, Sequoia, can manage a mere 16 petaFLOPS, or just 1.6 percent of the power geeks around the world have brought to bear on mining Bitcoin. The world's top 10 supercomputers can muster 5 percent of that total, and even the top 500 can only muster a mere 12.8 percent. And that 1 exaFLOPS number is probably a little low. Because Bitcoin miners actually do a simpler kind of math (integer operations), you have to do a little (messy) conversion to get to FLOPS. And because the new ASIC miners—machines that are built from scratch to do nothing but mine Bitcoins—can't even do other kinds of operations, they're left out of the total entirely. So what we've got here is a representation of the total power spent on Bitcoin mining that could theoretically be spent on something else, like real problems that exist naturally. Because of the way Bitcoin self-regulates, the math problems Bitcoin mining rigs have to do to get more 'coin get harder and harder as time goes on. Not to any particular end, but just to make sure the world doesn't get flooded with Bitcoins. So all these computers aren't really accomplishing anything other than solving super difficult and necessarily arbitrary puzzles for cyber money. It's kind of like rounding up the world's greatest minds and making them do Sudokus for nickels. Projects like Folding@Home and SETI@Home use similarly networked power for the less-pointless practices of parsing information that could lead to more effective medicines or finding extra-terrestrial life, respectively, and either are hard-pressed to scrounge up even half of a percent of the power the Bitcoin network is rocking. And with specialized Bitcoin-mining hardware on the rise, there's going to be an army of totally powerhouse PCs out there that are good for literally nothing but digging up cybercoins.